One Liner Review: It might be better and funnier than expected, but that isn’t saying much, and this movie is still good for a few laughs, but not much more. This movie is okay for laughs and dopey fun, but it sure isn’t very smart at all. the film is basically about two idiot brothers who go to clubs every night, but have no idea how to pick up chicks or even talk to them at all. then one night, their car gets hit by a celebrity and suddenly things start to change for them. from there we get a usual rise and fall story, which is basically the same story as any romantic comedy. first things are going great, then there’s a big fight, and in the end everyone reunites and puts differences aside to achieve happiness. it’s very cliched, and a much better will ferrell movie about idiot brothers is step brothers with john c. reilley replacing chris kattan. still, as a throwback to the saturday night live days that kick started ferrell’s career, this movie is pretty decent. good for some laughs, but not much more. A Night at the roxbury is a movie based on a quick saturday night live sketch that never gets very far. the sketch is about two guys who go to a club, shake their heads to the beat, dress like they are in saturday night fever, and don’t have any idea how to talk to women. instead, they approach women and bounce them around, sending the woman’s body slamming back and forth between the two brothers as if she were a ping pong ball. this is pretty much the extent of the saturday night live sketch. it’s funny on tv, but how they thought they could make a full length movie out of it is pretty crazy. and yet they did, and the movie really isn’t all that bad. that’s because these guys who star in the film, will ferrell and chris kattan, are natural comedic talents. they not only act in the movie, but also wrote it. and the movie, unlike the tv sketch, takes the boys outside of the club and into their lives where they live at home and work for their father at a fake plant store. these guys are such a mess that it’s pretty entertaining watching them go through life without knowing what’s happening around them. they tell the same stories again and again, which really have nothing to them (the time they saw emilio estevez at a payphone.) 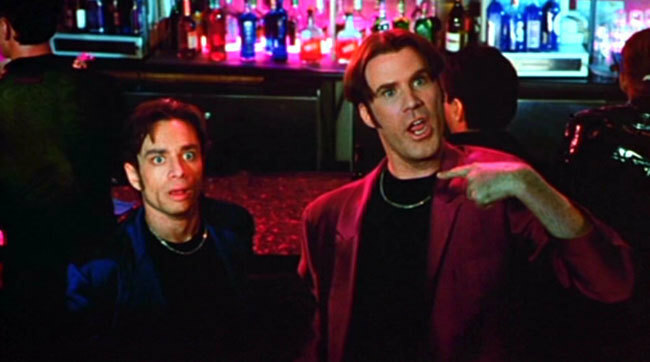 and every night they try to get into this club, the roxbury, only to have the bouncer (michael clarke duncan) tell them there’s no way in hell they’re getting in. each of the boys has a woman who he kind of flirts with. for steve butabi (ferrell), it’s emily, the girl in the light bulb shop next door to the plant shop, (played by molly shannon.) For doug butabi (kattan), it’s a credit card checker who he calls up every time someone comes to the register and tries to use a credit card. doug doesn’t even seem to know how to use the credit card swiping machine (in one funny scene, it falls apart on him), but he does like flirting with this operator and considers these moments his only chance to do so. their father, kahmeni butabi (played by dan hedaya) is basically doing the same role here that hedaya did in clueless. he’s the guy who can’t believe how out of touch with reality his children are, and is absolutely disgusted by it. kahmeni wants steve to marry emily so that he can achieve his store dream of knocking down the wall between the plant and light bulb store and making it all into one giant store, owned by the family. this is not very smart stuff at all. luckily the movie gets better once a real plot starts to develop. it all happens when richard grieko, of tv’s 21 jump street fame, crashes into their car one night. the boys get out of the vehicle and are just blown away by who it is that hit them. 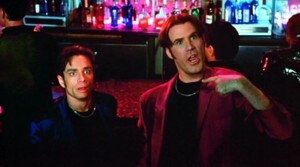 they want to get into the roxbury, and grieko’s only goal is to not get sued. so he takes them in, introduces them to the owner, benny zadir (chazz palminteri), and then takes off. now things start to get good for the boys. the owner, mr. zadir, takes an immediate liking to them. these guys spend their lives either going to or trying to get into clubs, and they have all kinds of ideas about how a club should be run. they even have an idea for a different kind of club where the whole place looks like the street outside. mr. zadir eats it up, and when two attractive women see him talking to the butabis, they assume the butabis are important and start going after them. the girls take the brothers home, and the scene where each brother is getting it on with a girl in a different room is hilarious. in fact, it’s probably the funniest scene in the movie, as the guys really just have one joke pick-up lines and no idea what to do if one of those lines ever actually worked. the girls are climbing all over them, trying to get them to shut up, and the boys are incredibly uncomfortable, and clueless about how they should be acting. now comes the downslide. just like any romantic comedy, or success story, the first half is all up and up, rise to fame kind of stuff. then the second half is about the fight or the decline where things really fall apart. of course at the end of any romantic movie, the two people find a way to get past their differences and reunite as a couple. this movie, like step brothers, another will ferrell movie about two brothers, fits right into the formula. starting with the next day, after their night at the club, the boys travel back into obscurity. they call up the girls and when the girls find out that these are actually nobodys and that mr. zadir doesn’t really know them at all, they drop the butabis fast. the boys go to see mr. zadir only to be turned away by his driver (colin quinn), and then thrown out by security. and the next thing you know, doug has moved out to the guest house and steve is marrying emily. everything in the second half of the movie happens really fast. it’s all just to get us to the wedding where we can have a climactic scene that is a cross between the graduate and say anything. luckily the movie goes on a little past this scene to show us the boys going after their club dream again, and also pursuing girls. this time, they actually know how to talk to them. i suppose that’s the character change that took place in the movie, but it might be the only thing that’s actually semi-smart about this film. 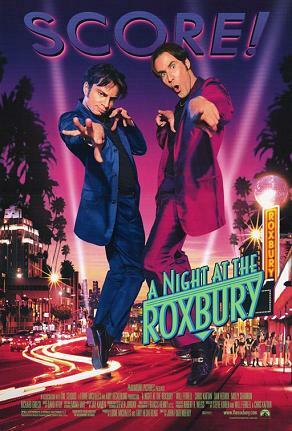 a night at the roxbury is funny at times, but it certainly isn’t all that clever and its story is very familiar and very formulaic.